The Nazi concentration camps began to be built in Germany in 1933. From then on, they became with increasing frequency the unswerving destination for the opponents to Hitler’s regime, the Jews and every other person deemed by Nazi soldiers as an ‘undesirable element’ (for such disparate reasons as listening to a forbidden radio station or being a communist). 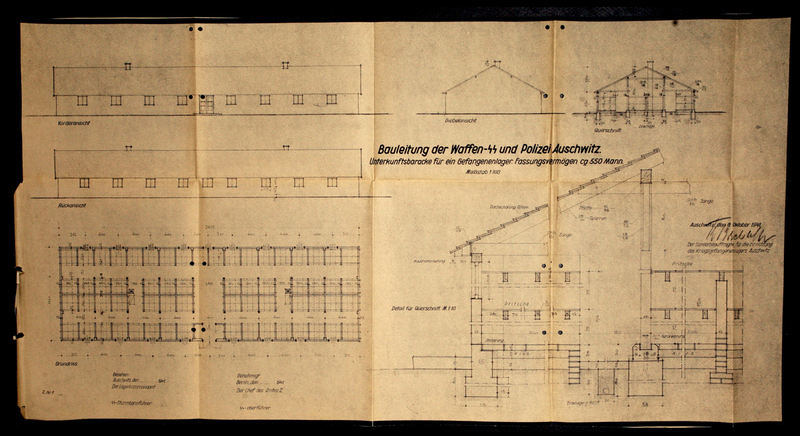 Original plans for one of the barracks in the Auschwitz II-Birkenau death camp. © Yad Vashem. After World War II was declared, Germany began to install these camps in its occupied territories throughout Europe and ordered, at the same time, the deportation of prisoners from other lands. Auschwitz I was created in Spring 1940 from some old barracks abandoned by the Polish Army artillery in the outskirts of the town of Oświęcim, annexed by the Third Reich after the occupation of Poland. It was expanded progressively to meet the needs of the SS. The first plan was to create there a camp for ca. 30.000 Polish prisoners. The first transport of political prisoners took place on June 14, 1940. Although it was conceived as a concentration camp, prisoners were also subjected to forced labour and tortured and exterminated on a daily basis. Auschwitz II – Birkenau Its construction started in Autumn 1941. It was divided in more than twelve different sections and became one of the key compounds of the German project to annihilate the Jews from Europe. Located 3 kilometres from Oświęcim, in the small village of Brzezinka (Birkenau), in May 1944 it held 90,000 prisoners at any given time, crammed in more than 300 barracks. Birkenau was home to the greatest part of the machinery of mass extermination: most of its victims were murdered in its gas chambers. Auschwitz III-Monowitz was active since October 1942. Also known as Buna, it was conceived as a labour camp for the IG Farben Buna plant in Monowitz. Yet Monowitz was also a concentration camp and slave labor was an element of extermination policy, as the factory managers ordered the periodic replacement of the workers weakened by hunger and exhaustion, who would be sent straightforward to the gas chambers. Besides, almost 50 subcamps and external commands to exploit the prisoners as slaves were established in 1942-1944 in the vicinity of Auschwitz. The burning capacity of the crematoria in Birkenau was -according to the Topf and Soehne company records-more than 4,000 copses a day. People were murdered by means only of the Zyklon B pest-killer in the gas chambers. During its most frenzied periods, in the Spring of 1944, the number of murdered reached 10,000 a day. Its location, 60 kilometres West of Kraków, in an area surrounded by forests and marshes that was also an important railway hub was by no means a coincidence. No single element in the Nazi extermination machinery was. 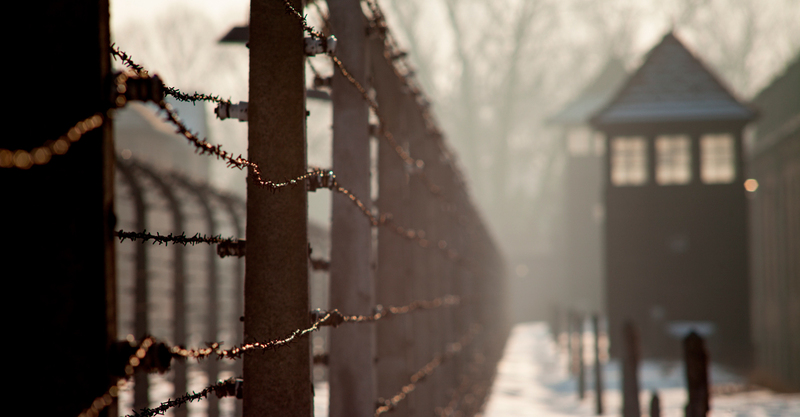 Today’s appearance of the barbed-wire fences, formerly electrified, of Auschwitz concentration camp. © Szymon Kaczmarczyk.